DALLAS – June 2, 2016 — Diverse women across the country have been challenged to take 10,000 steps a day and limit their added sugar intake to 24 grams a day through Go Red Get Fit and it’s proven to be an effective small step toward healthy living. The results of the challenge have been so contagious that thousands of women have now joined Go Red Get Fit and are taking a stand to be healthy, fit and beat heart disease, the No. 1 killer of women. “Up the Beat and Keep It 100” (June – August): Get 30 minutes of cardio per day, at least five days per week and strive to choose water over sugary drinks 100 percent of the time. “I Run This Salty Shaker” (September – November): Get 30 minutes of physical activity, at least five days a week and limit sodium consumption to no more than 1,500 milligrams per day. “Follow the Lead to Flawless” (December-February): Scripted exercises of the trainers’ choices and limit saturated fat consumption to 12 grams per day. For more information about Go Red Get Fit visit www.GoRedForWomen.org/GoRedGetFit/. 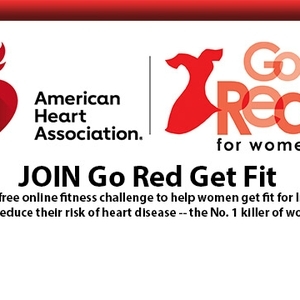 To join the online challenge now, visit https://www.facebook.com/groups/GoRedGetFit/, logon to your personal Facebook account and click on the “Join” button.